I'm not really sure about the significance of this space station scene right now...that will have to wait until a more detailed report surfaces! Anyway, coinciding with this image, we've got some news about Rockman Online at G-Star. G-Star is a gaming trade show in Seoul, Korea, running from November 18th to the 21st. The first glimpses of Rockman Online will come from the show where it will be playable to attendees. According to SGame, the showroom floor demo will feature the option to play as X, Zero or Duo as players explore an ancient Egyptian forest. Hopefully, we'll be getting some footage of the game in action around the 18th. I'll keep you posted! I have to say, their artwork is absolutely delicious. Amazing that we'll finally get to see gameplay! I'll admit, I'm ready to like it, whatever it is. I have no expectations so I'm 100% open to anything. 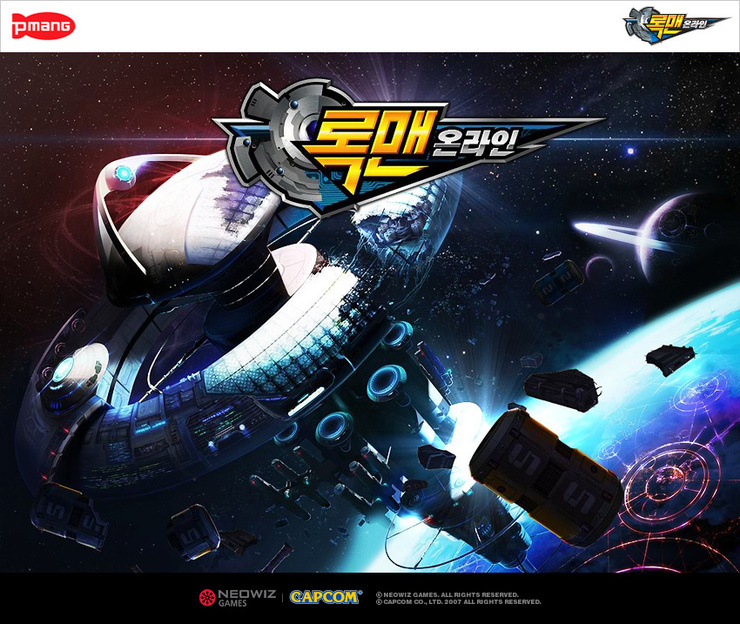 And I'm definitely gonna play it - wouldn't be the first Korean-only MMO I get into. Is that Eurasia spaceport, from Megaman X5? How did it get there after times passed? Maybe it's a time paradox??? The patterns on the planet look like those from the Rockman EXE movie. It's Eurasia with a vengeance!!!! Some time traveller took it back to the past so that Sigma would get even stronger!!!!!!!!!!! Oh wait, RMO takes place in the far off (?) future. @Anon 4: Maybe they rebuilt Eurasia? They´ve just built another Eurasia, what´s the problem anyway? Why is Saturn in the background? That is no where close to earth. @anon3: Perhaps you've never heard of the Nile River Delta? That was exactly what I thought when I read that part. Forest to desert to forest again. In the span of several thousand years. By the time this is over, it's probably going to be a desert again anyways. This year's GStar is in Busan, IIRC. It says the demo stages available will be the Forest of Kronos and the Pyramid of Secrets, not an Egyptian forest. Yeesh.